Open Angle Glaucoma: This type of glaucoma leads to slow, but relentless loss of vision. This is dangerous because people don’t realize they are losing vision until it is too late. This glaucoma can be treated with drops, laser or surgery. iStent® is not only the world’s smallest medical implant known to be implanted in the human body — it also started a revolution in glaucoma treatment as the first Micro-Invasive Glaucoma Surgery (MIGS) device. The first MIGS device approved by the FDA, today iStent® has been implanted in over 300,000 eyes around the world, with more and more patients benefiting from the iStent® procedure every day. Each tiny iStent® implant is comprised of a surgical titanium micro-bypass stent that’s preloaded in a single use sterile inserter. The specially designed inserter helps your eye surgeon maneuver the implant for accurate, micro-targeted placement. SLT is an advanced, non-thermal laser therapy works by stimulating a natural healing response in the eye to manage intraocular pressure. Utilizing nanosecond laser technology, SLT promotes cellular regeneration without the burn and scar tissue associated with other laser procedures. SLT is a highly effective approach for first-line glaucoma treatments, adjunct therapy with drugs, and alternative therapy when drugs or surgery fail. 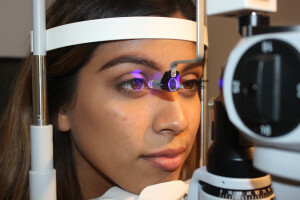 It is also a flexible treatment option, because it can be repeated, if necessary, depending on the individual patient’s response.This laser treatment is used to manage open angle glaucoma. The 5-minute procedure is performed in the office and the effect lasts 3-5 years. It is an excellent treatment to use instead of or in addition to glaucoma drops. This is a very effective treatment to prevent angle closure glaucoma in persons at risk. A 5-minute laser procedure is performed in the office after instilling drops in the eye. After the laser drops are used for 1 week only. Usually only one session is needed, but it can be repeated if necessary. My experience with Vision Consultants has exceeded my expectations! My surgeries have given me better unaided vision than I have ever had. Professional service that provides info & clarity to procedures which dealt with my concerns & apprehensions. I highly recommend Dr. Corrales & his team. After considering several doctors, I decided to have my pterygium removed at VCS. It was the right decision. Everyone in the office is very professional and knowledgeable. Dr Corrales is an expert in pterygium surgery and I couldn’t be happier with my results!